Oh, just when I had a plan, its gone out the window!!! Well, I thought I would thrift my cardis and yes, I did bag a couple yesterday. Today I browsed Uniqlos online shopping site-I was soo inspired, I just had to go and get the cardigan in purple at Uniqlo in Knightsbridge!! 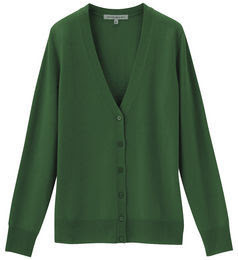 I also loved the cardigan in dark grey, but another time maybe!! The worst of it (well really the best of it) is these all come in LOTs of different colours, so as well as wanting more than one style, I wanted more than one colour too!! All the knits are 100% merino wool and the best bit is the prices-the cardi is £19.99, the dress is £24.99, the skinny jeans are £24.99, the short sleeve top is £14.99 and the polo neck is £19.99!!! Click on my title to view their range of wonderful knitwear!! I really could have browsed and spent more time and money here, but I stuck to my budget reluctantly and if I'm still coveting an item, I will go again next month!! 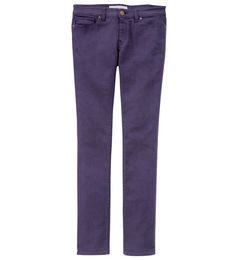 The skinny jeans are in all different colours, but I love the purple!! This top is great under a cardi or jacket!! For the price, the quality and style is very hard to beat, I heartily recommend you get your winter knits from here!!! Hi marte-yes, these could be next on the 'to buy' list!! Nice stuff, especially the purple pants! Hi b-thanks, I love the skinnies too!! Love the purple jeans. I meant to get some purple cords from J.Crew last year but never got around to it. Now I'm interested in the mustard color. 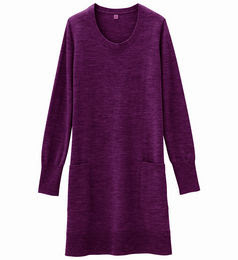 i like the purple dress and the grey top for layering. I love all the colors, really need that for fall. I love that color green, it's one of my favorites. i remember when dark purple was big for fall and i got purple skinny jeans. glad it's still popular! Hey Sharon, these are some sweet items! The jewel tones and grey are wonderful colours for fall! loving the purple jeans also. they would be fabulous with a number of different colored boots for fall, whether it be tan, gray or black! love it, that color cardigan is great too. I'm looking forward to getting to a uniqlo sometime soon! i love coloured skinny jeans and that purple dress/shirt! Hi wendy-yes, mustard is another great colour for Autumn! Hi wendy-yes, they are really great basics!! Hi jen-yes, perfect for Autumn! Hi krissy-yes, get them out ready for Autumn! Hi jess, yes, they're great!! Hi danz-yes, I'm loving these styles and colours-have a good day too! Hi cupcakes and cashmere-yes, I totally agree, I may get these soon!! Hi pamcasso-thanks for your lovely comment! Hi pam-yes, I'm really impressed with Uniqlo too! Hi sydney speel-yes, me too, thanks!! 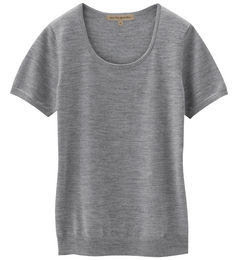 Uniqlo has a great selection of comfortable basic pieces. It's a shame I'm really too cheap to invest, but I really do enjoy their simple designs. Damn uniqlo - they are so good at making you go off the rails! Hi christina-yes they are definitely great value for money!! Hi kate-oh, I could have spent more in here yesterday-the quality for the money is brilliant!! 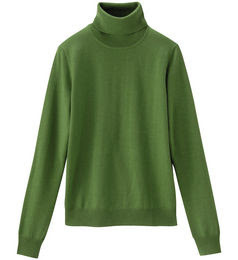 I'd love to find a great sweater coat for fall. I should bite the bullet and get one before I can't find my size. I love having a sweater dress, too. Thanks for the comment. I do enjoy your feedback. You really know where to buy beautiful clothes, cheap price, high quality. Fantastic picks as always, dearest Sharon. 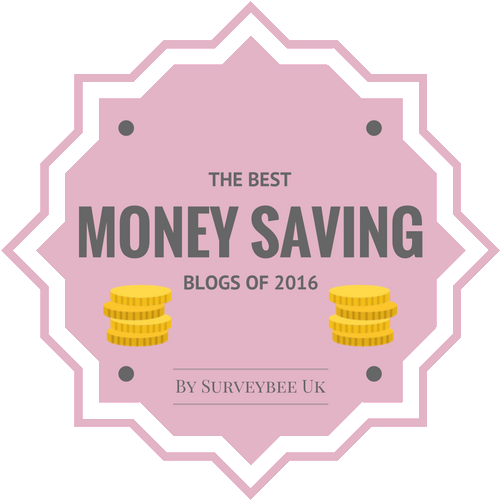 You have such an eye for a season's must-haves, and make the best selections at affordable prices! Love the purple jeans, and those cardigans are a steal! Hello Uniqlo, you must come to NORWAY! !Haha, I am trying to catch up after a week of fashion mania, and I also realized I am in need of some serious shopping!!! Hi Sharon! Such great pieces and colors! Hi angel-I love to try different colours, thanks!! Hi ellie-Now is when the new things are in the stores!! 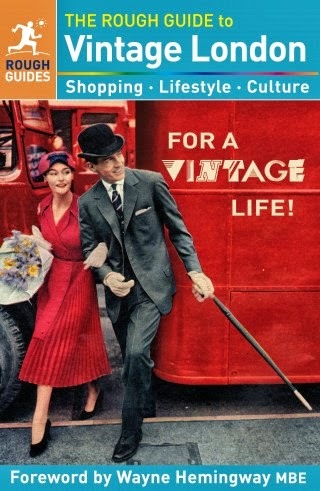 Hi tupersonalshopperviajero-thanks for your lovely comment!! Hi mira-yes, cheery for Autumn! Hi ida-always so kind, thanks a lot dear Ida!! Hi silje-yes, its been a fantastic week for you, with a new job and fashion collections, lucky you! thanks for your lovely comment too! Hi acielle-yes they are great, thanks a lot!! Hi fashion chalet-thanks my dear!! the weather is rather depressing for August! !